Lindsey Powell is finally free of her estranged husband, though she's trying not to be too tickled pink. See, he didn't sign the divorce papers. Instead, he went up in a puff of smoke, or rather a big explosion. Either way, she's free, free at last. Unfortunately, she's now saddled with her in-laws and a woman who claims her child is Rick's son - all of which are trying to get in on his estate. It would have been so much easier if Rick had just lived long enough to sign those papers. An absolute laugh out loud cozy mystery. Sally Berneathy is quickly becoming one of my favorite authors. Not only are her characters amazing, but the story is written in such a way, that it could be real. I think The Great Chocolate Scam is the best of the series so far. I laughed so many times and there were lots of scenes with my favorite character, Fred. 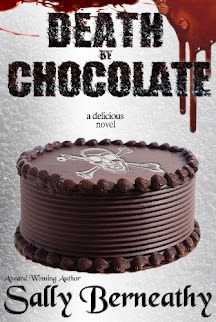 I highly recommend this book to anyone that wants a good laugh, enjoys cozy mysteries, and loves chocolate. The recipes at the end of the book are simply to die for.